There, I said it. I value my relationships with family and friends more than anything else in this world, and experiencing the world through travel is my passion. Yet, I still like my things. Quite a lot, actually. That’s partly why I don’t think I’ll ever be a total vagabond who gives up all her worldly possessions to trot the globe. So, the challenge I faced as a hopefully-Madonna-approved “Material Girl” was how to pack for Peru as minimalistically as possible. See what I mean? Challenging. 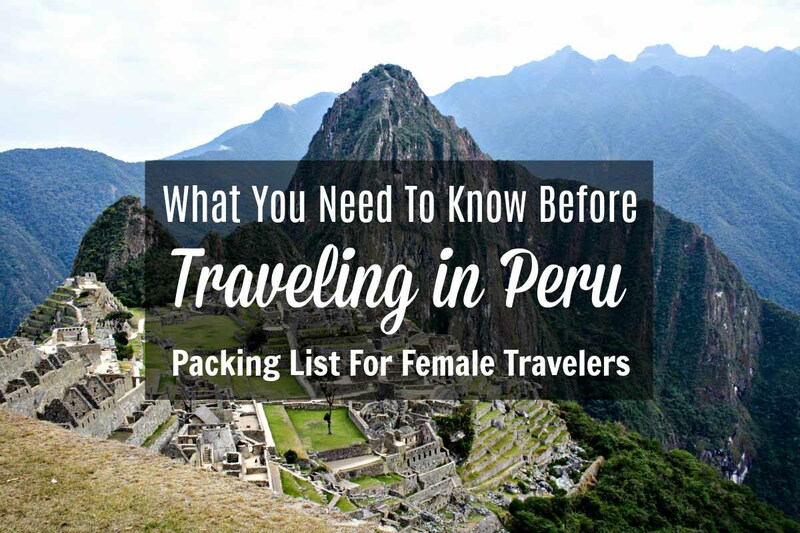 If you are wondering what to pack for Peru, I hope you’ll find my packing list a helpful resource. 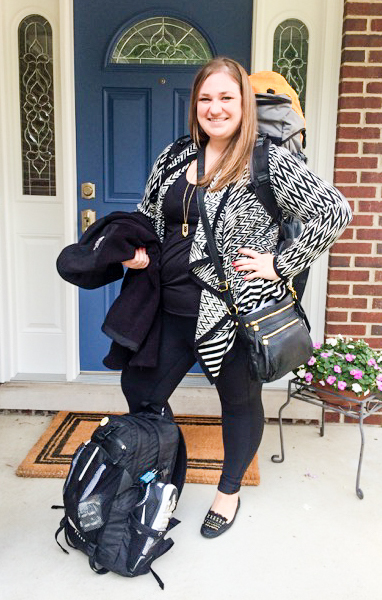 In this post, I also share what I overpacked, so please learn from my mistakes! Packed and ready for Peru! 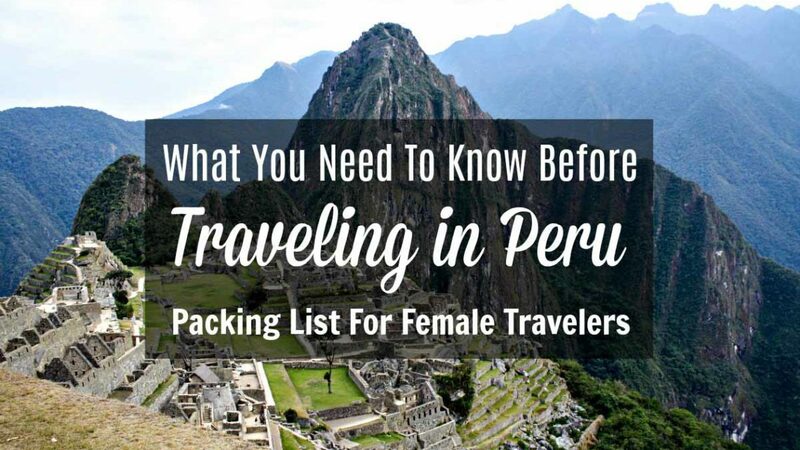 Considering that Peru is a developing country with many rural destinations on my itinerary, I figured pulling a wheeled suitcase would not necessarily be most convenient if the roads are not smoothly paved. As I suspected, this was indeed the case. In retrospect, I think I could have managed pulling a carry-on wheeled suitcase. 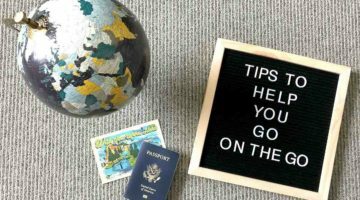 So, I planned to pack everything in my Deuter backpack (checked baggage on flights), the North Face backpack (carry-on bag), and a Jessica Simpson cross-body purse (personal item). To keep my belongings organized and to save space, I rolled or folded all of my clothes as small as I possibly could and sorted them into the following groups: jeans, workout capris, dry-fit shirts, blouse with camis for layering, tanks/T-shirts, PJs, socks, underwear, sports bras, bras, track jacket, bathing suit, and change of clothes for my carry-on should my checked bag get lost/delayed. I then placed each group into plastic slider bags — I used Hefty, but Ziplock and similar brands would work as well — zipped the bag to about an inch of closing, and then leaned onto the bag to squeeze out the air as I zipped the bag closed. You might call this the poor man’s travel cubes, which so many of my fellow travel bloggers seem to swear by. *Indicates I wore something in that category on the flight to Lima. Outfit I wore to fly to Lima, Peru: Athleta leggings, American Rag black tank, INC tribal cardigan, Aldo flats, Jessica Simpson purse, Oliver Peoples sunglasses, Aldo ring and bracelet, and gold chevron necklace. Technology packed for Peru: Canon Rebel, telephoto lens, selfie stick, iPad with keyboard folio, Mophie chargers, adapter, memory cards, and chargers packed in cosmetic case. 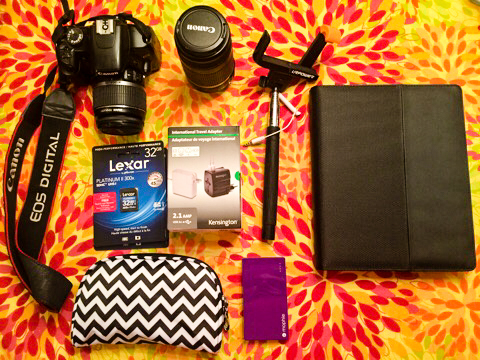 What were the best things I packed for Peru? Cottonelle flushable wipes + Purrell hand sanitizer wipes + Bath & Body Works pocket-size hand sanitizer — Public restrooms are not always equipped with toilet paper, soap and/or paper towel in Peru, especially the roadside shack-like restrooms I encountered during long bus rides through the Andes. Never on my trip did I need to buy toilet paper to carry around with me, and the wipes were more compact to carry in my daypack. Drawstring backpack — My Adidas drawstring backpack is a more compact daypack than my North Face backpack, but it is still large enough to hold my camera, extra lens, selfie stick, phone, wallet, lightweight jacket, hat, sunscreen, bathroom necessities, and a water bottle. My backpack actually has two water bottle holders, and a waterproof pocket where I kept my phone. Lifeproof phone case — With this waterproof case, I was able to take photos in the hot springs. Pepto Bismol and Ciprofloxacin — When you get food poisoning, you won’t necessarily be able to get yourself to a pharmacy to purchase these medications. They are sold over the counter in Peru, but — trust me, someone who got food poisoning in Peru — you’ll want to have this on hand in case of sudden illness. Pashmina-style scarf — This was a multi-functional article of clothing! It was an extra layer of warmth in the cold mountain climates. It was a lightweight layer that provided protection from the sun. It was a blanket when I napped on long bus rides. Spanish-English pocket dictionary — This was a last minute addition to my packing list since I figured I would almost always be with a Spanish speaker, but I’m so glad I added it! My travel companions and I found it incredibly helpful when trying to decipher restaurant menu items even with nearly fluent speakers among us. What did I overpack for Peru? Umbrella — I was in Peru during the dry season. The few times it did rain, it was a light drizzle, and I didn’t have my umbrella with me in those moments anyway because I hate carrying it around. I would have been better off packing an emergency poncho for Machu Picchu instead. If you will be in Peru during the dry season (winter), I recommend either packing a lightweight rain jacket (in lieu of the track jacket I packed) or a poncho that folds up to about pocket size to keep in your daypack. Yellow Fever Vaccination Certificate — I was told by my travel doctor to carry it with me, but I was never once asked to present it in Peru or the United States. Bug spray — I had enough bug spray wipes on me to use two per day for the entire three weeks, but the only place I encountered mosquitoes was Machu Picchu. One bottle of bug spray and one pack of wipes would have been more than sufficient. You can also buy bug spray in Aguas Calientes. The pharmacies and little tourist shops all carry Off! just like you’ll find at drug stores and supermarkets in the states. Plug adapter — All the hotels had outlets that fit North American plugs, especially the flat prongs of the iPhone charger. Water shoes — Contiki recommended Teva sandals for the hot springs, but I find those sandals absolutely hideous. Sorry, I am so not sorry for that opinion. The packing list specifically stated to not use flip flops for that activity, so I took my water shoes since they worked out great for climbing over rocks to get to a cenote in Mexico and kept my feet from touching slimy things when I went on the WaveRunner on Lake Michigan. Once I got to the hot springs, I realized that it wasn’t in nature. It was like a pool, so I totally could have worn flip flops after all. Flip flops also would have been nice to use as slippers inside the hotel rooms, which often had cold tile floors. With a few minor changes, my packing system would have been a complete success. Hopefully, you can learn from my mistakes! Save this packing list to Pinterest for future reference! 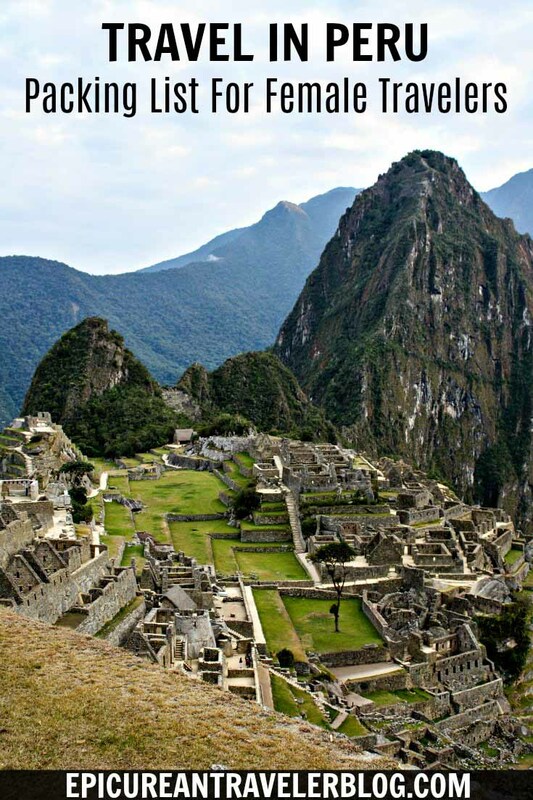 If you have traveled to Peru, what would you add to this list? Little gifts to give out are a great idea. I wish I had thought of that before traveling to Peru. For sure, antacids and Pepto Bismol! I also recommend an antibiotic for more severe food poisoning like I unfortunately experienced. Luckily, I wasn’t robbed either, but I have heard stories from others who have been. It’s always important to stay vigilant, have a buddy whenever you can, and zippered pockets are great for keeping grabby hands out of your bag. I hope you enjoy your trip back to Peru, Jessie! Eat some ceviche for me! Very good information and laid out nicely so easy to refer back to. Overall, appeared you were well prepared and organized for such a challenging excursion. I have to 2nd your comments about the bug spray wipes and plug adapter!! I spend way too much time researching both considering that I didn’t really need either while in Peru. I was glad that I had them, but I also had the room in my luggage for both. I think the 2 things that I was sooo happy that I packed were my water bottle and a light jacket. I used my water bottle non-stop (this one is kinda a given) and I used my light jacket as a type of purse during the day while volunteering. I had no idea that I would end up using my jacket as a purse, but was really happy I had it! And the one thing that after the fact I wished I packed was a Spanish-English pocket dictionary!! So freakin handy! At times I wished I had packed a water bottle, but that was mostly while we were volunteering. After that buying water bottles became a lot easier! I also used my track jacket like a purse when we were volunteering. Since neither of us were pickpocketed, I think that was probably a smart decision on our parts to not carry purses for those few days. So yes, to anyone going to volunteer in Huaycan, take a lightweight jacket with zipper pockets to carry whatever you’d normally carry in your purse! Unfortunately, petty theft is a common crime there, and you don’t want to advertise that you have a lot of nice things in your bag. Great list! Love that you have all your clothes in a reasonable color scheme too — helps to have everything automatically match so you can really mix and match a limited supply of clothing! Yes! When you have limited space, it really helps that every piece can mix and match. 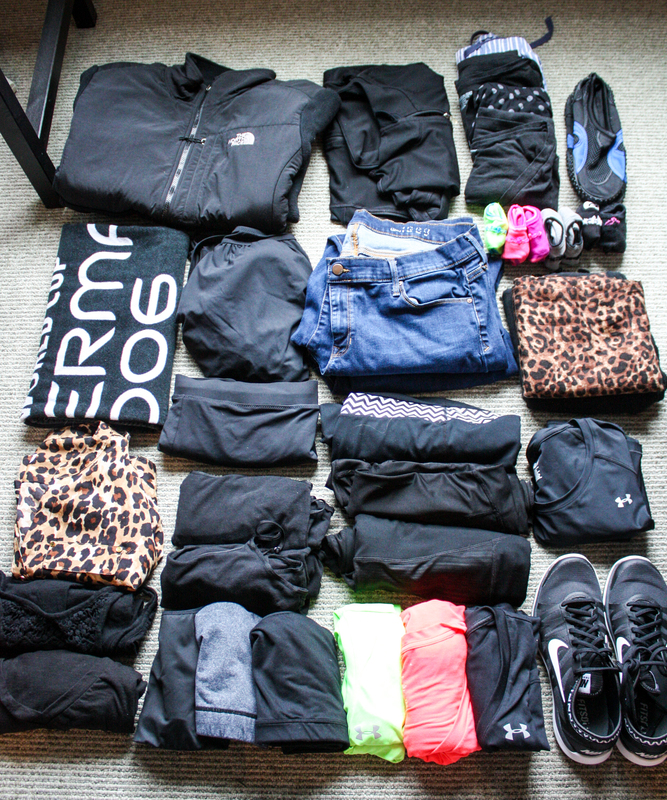 I wore a lot of black in Peru, but it made packing and doing laundry really easy! I found that with the multiple flights and shifts in altitude, liquid toiletries had the tendency to explode. I packed solid shampoo and conditioner, bar soap, and facial cleanser from lush. You also get the benefit of packing those things in your carry on without going over the liquid limit. For the same reason, bring an extra pair of contact lenses! My case leaked one day, ruining one of the lenses. So glad I had brought extras. Speaking of exploding liquids … When I opened my aloe vera in Puno, it squirted all over the wall! Oops. So I can see how using solid shampoo is great idea, Chantal. How did you like it? Since I don’t wear contact lenses, I would not have thought about issues related to eyewear. Bringing extras definitely sounds smart!